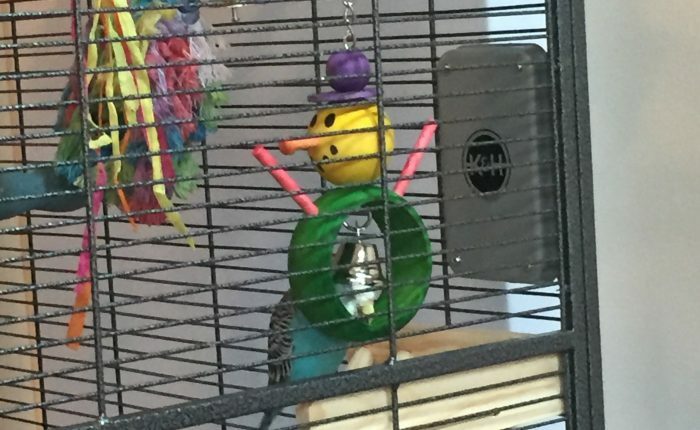 It’s now January of 2018 and we finally have a budgie that likes the K&H Sand Thermo-Perch Heated Bird Perch Small ! Our new boy Kevin sits on the heated perch every afternoon for his nap time and you can tell he feel very comfy-cozy. Since he’s a bit smaller than our girls I’m so happy he has the extra heat of a bird warmer. Also I’m so pleased that all of our K&H warmers have been incredible safe and reliable, as this is their third winter in use and we have had no trouble with them whatsoever. We keep our house at a steady 69 in winter, but I know that a lot of folks would find that either too warm at night and/or prohibitively expensive, depending on your type of heating. 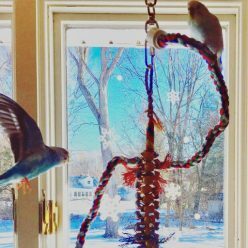 We’re also pretty lucky that the parakeets’ cage is in a relatively draft free zone, at least 3 feet away from a window and quite a bit more than that from a door. It’s probably one of the warmer areas of the house, especially since the bedrooms tend to be on the chilly side. Anyway, I know that budgies still like a bit more warmth than 68, even though they seem to have adjusted to our indoor winter temperature very easily, so I bought them the K&H Snuggle Up Bird Warmer Small/Medium for a little extra heat. Last year we had the K&H Thermo Perch, Small and Toby wanted no part of it, and in fact began avoided a full ¼ of her cage just to ensure she never had to land on the perch. We tried it again this fall, thinking maybe Kelly could influence her in to giving it a try, but instead they both just kept away from it. Even though Toby has some issues with color-based fear, I decided to try the K&H Snuggle Up Bird Warmer Small/Medium , hoping that gray would not be too threatening and that even if they just occasionally ended up near it playing with a toy, that would be fine by me. The warmer installs easily, you just have to make sure your cage is near an outlet or have an extension cord handy. This is an extremely safe heater in our experience; it’s now been on continuously for about a month and always maintains a consistent and comfortable temperature. I wouldn’t hesitate to leave it on if we were going away for a weekend or a longer period of time. As expected, the parakeets are not really in love with the warmer , they don’t specifically go over to it, or (as the name implies) snuggle up to it at all. But, I put it above a nice corner perch that they could hang out on for a while if they wanted, and I make sure to put fun toys nearby to lure them over. Thus far they don’t in any way avoid it, and that was my best case scenario, so I’m very happy! And, they may make the connection at some point and start going over when they feel chilled; a month is way too early to know how they will react by the end of winter. 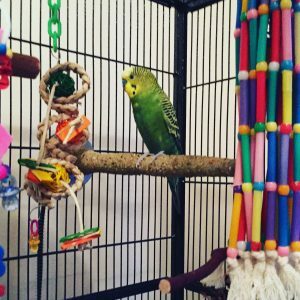 My final verdict is a definite go for it – even if your parakeets, like mine, aren’t totally sold on the concept, it gives me peace of mind to know that there’s a source of extra warmth in the cage, and that it’s extremely safe and I can feel comfortable leaving it plugged in and running 24/7 is fantastic.